Born in Turin, Laura has always been involved in the world of Tourism, starting from the earlier days with a degree as a Technician of Touristic Activities. She lived in Turin, Parma, Viterbo and on Lake Como where she still lives. After five years’ experience as owner of a workshop where she built original kites for competitions, she decided to change her life and enjoy a new experience in Greece as a Rep for a Tour Operator. She lived 3 years in Greece between Athens, Rhodes and Crete. Afterwards she returned to Italy, still working for the same Tour Operator, taking care of planning trips for Italians abroad. 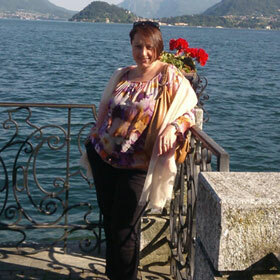 Four years later, she moved to Lake Como where she started to work for a Travel Agency for a few years and then in 2001 she started her experience as Senior Leisure Sales Executive in one of the top Destination Specialists doing what she discovered to be her passion for 11 years, preparing deluxe tailored made experiences. She participated and organized amazing Fam trips as well as business meetings in USA and France. In 2012, she decided to renew her life with a burst of joy and energy, reaching out to Exclusively Italy and working alongside Frances and Alessio, as an outside agent doing what she really loves: creating lifetime experiences for her clients.